What dose of melatonin should you take? Delayed sleep phase syndrome (DSPS): Melatonin 0.3 to 5 mg daily for up to 9 months has been used. Insomnia: For primary insomnia, controlled-release, fast-release, or slow-release melatonin 2 mg to 3 mg before bedtime for up to 29 weeks has been used in most research. Melatonin is not solely used for treating insomnia or sleep related disorders. It can also be sued for benzodiazepine and nicotine withdrawal. Melatonin is also used orally for Alzheimer’s disease or dementia, bipolar disorder, chronic fatigue syndrome (CFS), chronic obstructive pulmonary disease (COPD), beta-blocker-induced insomnia, endometriosis, tinnitus, depression or seasonal affective disorder (SAD), mild cognitive impairment, nonalcoholic steatohepatitis (NASH) and other problems.2 You should check with your doctor before using melatonin for any of these other diseases. At Community Farmacy, we offer a variety of over-the-counter products. Melatonin is available as a non-prescription product, and it may be purchased over-the-counter. 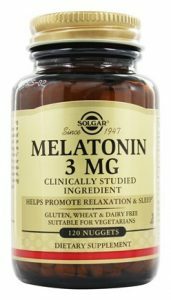 One product sold by Solgar is one of the best and most cost-effective melatonin products we carry. Melatonin dosage strengths range from 1 mg up to 10 mg or more. However, it is not regulated by the U.S. Food and Drug Administration (FDA). If you have any questions regarding melatonin, please call us or stop in – one of our friendly pharmacists will be more than happy to answer any questions you might have! Written by Kamal Patel, PharmD Candidate, Class of 2018, University of Maryland Eastern Shore School of Pharmacy.